It’s hard to believe it’s been a whole year since my first post on this blog. It’s always a pleasure to present my research on sewing patterns and meet fellow bloggers and readers who share my interest in the rich history of home sewing. 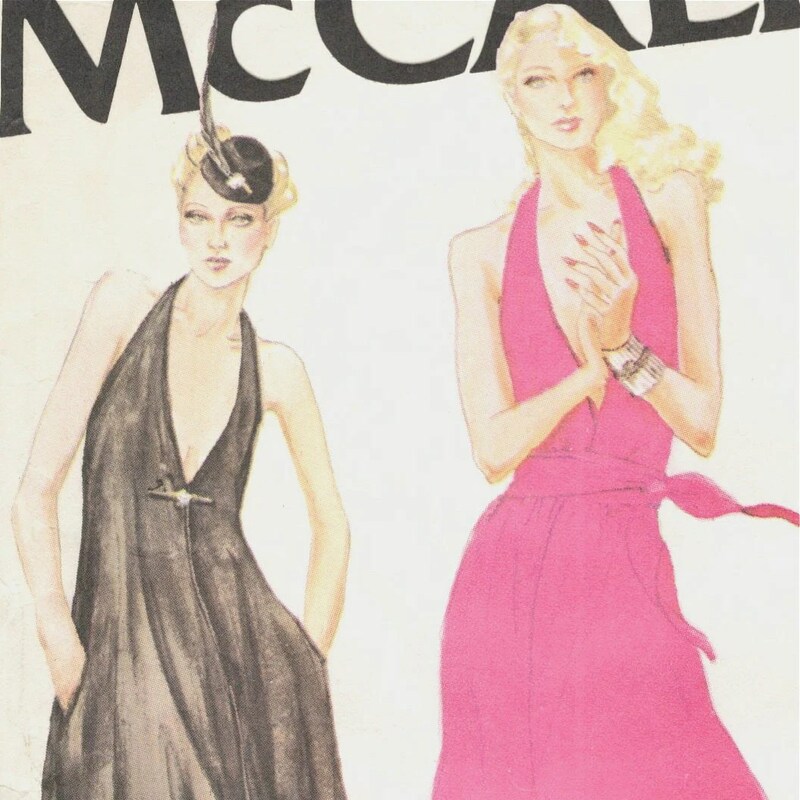 Over the past year, between research posts, I even managed to squeeze in some posts on my (sporadic) sewing: on an older project, my black tartan wedding dress, Vogue 1894; on a set of designer 1920s costumes inspired by True Blood; and my 1960s Yves Saint Laurent dress, Vogue 1556. And it was a true honour to be featured on We Sew Retro and in Vogue Patterns’ blog watch in my first year of blogging. I recently got some outstanding academic work off my desk and can’t wait to do more vintage sewing—particularly from my 1930s patterns. In the coming year I’m also looking forward to doing more research posts on designers and models, as well as sharing a surprise or two. To celebrate my blogiversary I’m throwing my very first giveaway: one lucky reader will win a gift certificate of $25 CAD, good toward anything in the PatternVault Etsy shop. To enter, just leave a comment below. The giveaway closes Saturday, July 14th at midnight EDT. The winner will be chosen at random and announced this Sunday, July 15th. Happy Anniversary! Wonderful blog. Enlightened and informative. Well researched! Hope you’ll keep it up! YAY! Happy Blogiversary! I always look forward to your posts and love, love, love your posts on your creations, pattern history, pattern designers, etc. Definitely count me in on the giveaway!! And here’s to many more years of blogging fun! What a great giveaway! I would love to enter as I am learning so much from reading your blog. Somehow you put the most refreshing spin on vintage. Since following you I am inspired to look to the past for inspiration which I never did before. Thanks for this whole new inspirational point of view. Happy birthday and many many more! Congratulations! I love the information you give and your writing style – you help make me a better sewer! Congratulations on your milestone and happy blogiversary. A year is a long time! Happy year anniversary Sarah and many years ahead to Pattern-Vault !! Happy Anniversary! I’m coming up on mine too – love your blog and a big, humungous thank you for all the research and information you’ve provided to us sewing maniacs for the last 12 months. Congratulations! I feel like I’ve learned so much from your blog already. Can’t wait to see what you post in year 2. Happy Anniversary! I have truly enjoyed reading your blog during the past year! Congrats! Being featured on We Sew Retro and Vogue Patterns’ blog watch is evidence of what a great blog this is. I’ve especially enjoyed seeing your 1960’s Yves Saint Laurent dress made-up, and discovering the existence of a Chanel pattern (now if only there was a Balenciaga!) and your in-depth research on the designers of patterns, such as McQueen for Givenchy. There is no other blog quite like it out there. I look forward to reading the posts from PatternVault’s second year! What I love about your blog is how it informs us of things beyond the pattern envelope. I have learned so much from you this past year. Wow, happy blogiversary! This sounds like a great giveaway, I love your pattern shop. Congratulations on the anniversary. I wish you have many more years of success!! This is a great blog. Congrats! I am a huge fan of your blog, I truly admire the work you put into your research. I know how hard it is after writing a column on fashion designers for the Colette Patterns blog for a year. I’m really eager for you to cover the Issey Miyake patterns for Vogue. Also your current series, as I’ve done some research on my favorite model of the 80s, Louise Vyent, a dutch/african model who appeared on a few Vogue patterns too.